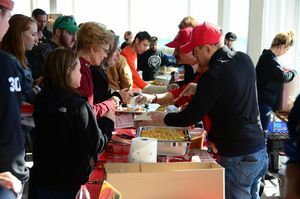 Over 300 gallons of classic and creative chili along with classic and creative mac ‘n cheese dishes were devoured by approximately 1,200 people who attended The Great Mac & Chili Challenge at Sherwood Island State Park on Sunday, Nov. 4th. The crowd arrived early with muffin tins in hand to hold their samples to ensure they got to sample and vote on everything at the event. “The weather was perfect for this comfort food event which contributed to the good turnout,” said Jim Keenan, event director. “It’s always difficult to estimate how much each restaurant should make as you don’t want to make too much so the crowd was smart to come early as some restaurants tend to run out before the end of the event. Thankfully everyone was full and happy when they left”. Old Post Tavern won the creative chili category with a “meat lovers chili” besting Cask Republic of Stamford, Geronimo Tequila Bar in Fairfield and Simply Delicious Catering, last years champion. In the hotly contested creative mac category, Cask Republic in Stamford won for their second championship with their popular pesto mac‘n cheese. The dish outscored a cheeseburger mac from I’m the Mac in Stamford, a Buffalo mac from Planet Pizza in Norwalk, a beer braised short rib mac from Tarry Lodge in Westport and a “jacked mac” from Simply Delicious Catering in Norwalk that has won this event previous years. The event raised additional funds to be added to those raised at Chowdafest to be donated to Food Rescue US in the ongoing fight against hunger. The combined events should fund over a half million rescued meals for the food insecure. The Great Mac & Chili Challenge, is sponsored by: Cabot Creamery who proudly supplied the shredded cheddar cheese and sour cream to the chili contestants, WEBE 108 and City Carting & Recycling.